House First: Lawmaker In Wheelchair Presides To Honor ADA : The Two-Way House honors American Disabilities Act with a first, a lawmaker in a wheelchair got to preside. The same nation that almost 100-years ago had a president, Franklin D. Roosevelt, who used a wheelchair and leg braces because of polio had never had anyone preside over the House of Representatives from a wheelchair, until Monday. 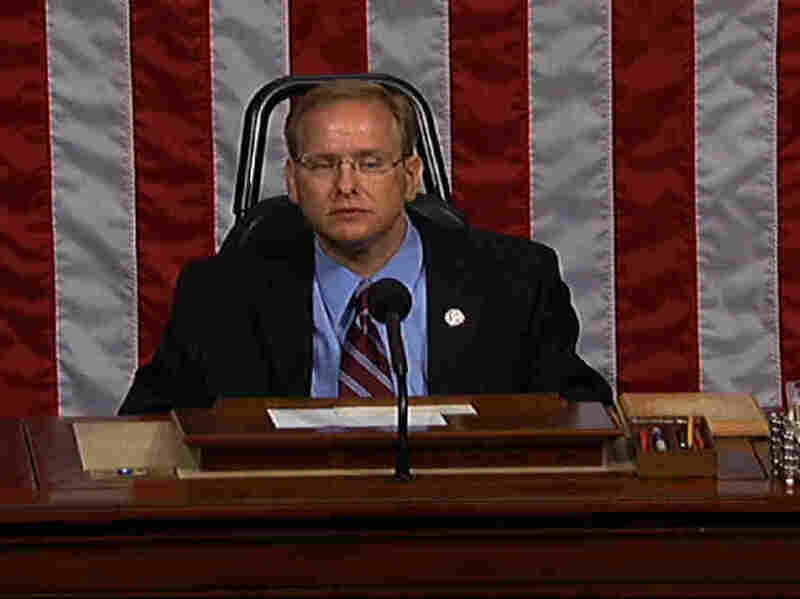 To honor the 20th anniversary of the signing of the Americans With Disabilities Act, Rep. Jim Langevin, a Rhode Island Democrat who has been a wheelchair since a gun accident left him a quadriplegic as a teenager, got to wield the gavel. ANDREA: By age 24, he was in the Rhode Island legislature. Later, when he came to the U.S. Capitol, it was a maze of steps and narrow hallways. Today, as he makes his way to his congressional office, he maneuvers down ramps and curb cuts and through automatic doors, all of which exists because of the Americans with Disabilities Act. Langevin says the ADA has brought freedom to people like him. LANGEVIN: The ADA has allowed me to concentrate on my job as opposed to "what do I have to do to get from point A to point B?" ANDREA: The last obstacle in the Capitol, says Langevin, was the rostrum of the House of Representatives. It now has a series of lifts that allow him to rise to the microphone and take the gavel. Even more important are changes in people's attitudes, he says. Langevin is not thought of as the "congressman in the wheelchair" or even the "congressman who fights for disabled rights." Langevin is an expert on the wars in Afghanistan and Iraq. He's led congressional trips to war zones, riding in the back of a C-130 military plane.